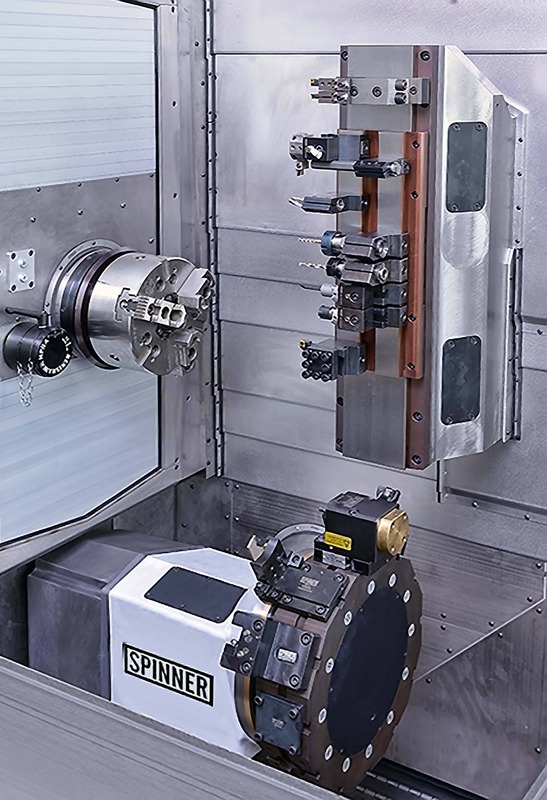 The sixth generation of ultra-high-precision turning centres from Spinner, Germany, which started manufacturing them in the 1950s, was for the first time presented on the manufacturer’s stand at the AMB 2018 show in Stuttgart (18 – 22 September). Available in the UK and Ireland through sole agent Whitehouse Machine Tools, the new Microturn lathe is built in two sizes and is capable of producing components to well within 5 microns dimensional tolerance in series production. To enable this degree of precision, including when hard-turning and micro-finishing components, what Spinner describes as ‘disruptive influences’ from turrets, Y-axes and unnecessary heat sources have been minimised. Additional design features allow users to employ as few axes as possible for any given production process. The concept is based on the company’s previous ultra-precision lathes, which employ a 2-axis spindle head on a compound slide, in this case moving 600 mm in X and 350 mm in Z, with optimised positioning accuracy and balanced thermal characteristics for fine positioning. The spindle operates in conjunction with a static, linear tool carrier integrated into the vertical machine bed (L-Version). Not only can turning tools be mounted on the carrier, but also heavy special tools such as grinding wheels or high-speed drilling spindles, if desired. Recognising that companies producing smaller batches of parts need greater flexibility and fast set-up times, Spinner have provided a number of options. One is a BMT45 turret with a ± 50 mm Y-axis and 12 stations, optionally driven at 8,000 rpm, that can be added at the bottom of the working area (LT-Version). 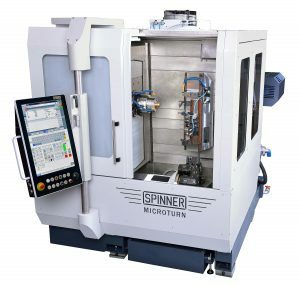 For extra versatility, it can be joined at the top of the working area by a 15 kW / 12,000 rpm pivoting B-axis milling spindle with ± 50 mm of Y-axis movement and an HSK40 interface (LBT-Version). It can be served with cutters exchanged from a 33- or 72-station tool magazine. There is also an LTBS-Version with an opposing counter-spindle, identical to the main spindle, for simultaneous parallel machining or synchronous workpiece transfer to enable one-hit production. All of these options cannot match the ultra-precision achievable with the fixed linear tool carrier. Nevertheless, with high pressure delivery of temperature-controlled coolant at 70 bar to the point of cutting, and the vertical bed efficiently evacuating hot swarf to the standard chip conveyor, the turret and B-axis are capable of attaining tight tolerances that may well be acceptable for finish-machined features. If not, they are ideal for pre-machining prior to fine finishing in the same cutting cycle using the linear tool carrier. The Microturn 36 and Microturn 52 lathes (the numbers representing the maximum bar diameter) are equipped with in-house built, water-cooled motor spindles incorporating modern synchronous drive technology. Their respective ratings are 7,000 rpm / 10.5 kW / 50 Nm and 5,200 rpm / 22 kW / 130 Nm, although speeds up to 10,000 rpm are possible using hybrid bearings. Chuck diameters are 160 mm and 210 mm respectively, swing diameter is 608 mm and maximum turning length is 250 mm.